We used to have this thing we affectionately called Triple Date Night. We were a group of six friends, three couples, and once a month or so we would call a nationality and create a dinner party. Whomever’s home was hosting would make the main course, and the others covered the entree and dessert. You needed to make something you’d not done before and we had some wonderful meals and created some wonderful memories. We always drank a lot of wine and one night someone even pulled out a Scooby Snack. Being as none of us had really smoked for about a hundred years, a couple of puffs and the party was over pretty quickly………aaaaah, Triple Date Night. South American Night, Japanese Night, Italian Night, Middle Eastern Night, they all turned up veritable feasts on our tables. I was most impressed by one special dater making home made Fortune Cookies and Turkish Delight…..I really miss that gal. Usually, it was the girls that cooked but boys took Chinese night and I ate some of the best dumplings I’ve ever eaten. It was a time that we all cherished, but life did, as life does, change and our Triple Date Night split up. Not for no good reason, one of the couples moved to Europe so that really threw a spanner in the works……..and we had babies and moved to the ‘burbs. We have new and different gastronomical feats in our new home…and new and different people at our table. It shows that life is constantly evolving and changing but as long as there’s great food we can adapt! For French night I made Cassoulet. A real one, with succulent pieces of roast duck, herby Toulouse sausages and rich pork belly. It’s classified as French peasant food and once again I was reminded that if you’re ever going to be a peasant France is a cracking place to do it. In Australia, peasants eat tinned Spaghetti and Spam. That damned pot of beans took me three days to prepare in the traditional fashion and by the time it hit the table I was expecting it to positively sing like angels on my tongue. Alas, I was underwhelmed. I smothered mine in Tabasco and it was nice. Not quite three days worth of nice. Also, bears mentioning that the original recipe made the biggest damned pot of Cassoulet you’ve ever seen and I was eating those beans for DAYS…. Anyway, I have since found a way to cheat it that is faster, easier and tastier. I often ferret around in the freezer and just use whatever meat I have in there…..bacon will do for speck, any chicken or duck, and old sausage works. This can be eaten by the whole family…..I even blended some of the beans and carrot and gave it to the baby mixed with avocado. It does have a little salt in it, but I was so busy cooking this that I forgot her dinner! 4 good sausages, I like Toulouse, choppped into chunks. 1 cured chorizo, or 150g speck, sliced. In a big heavy pot, preferably one that can go from stove to oven, pop your chorizo or speck on a low heat to cook and render out the fat. When cooked remove from pot and add your sausages and chicken to cook in the rendered fat. Brown lightly and remove from pot. Add a little oil if needed and toss in your onion and stir until translucent. Add your garlic and get it all yummo and fragrant. 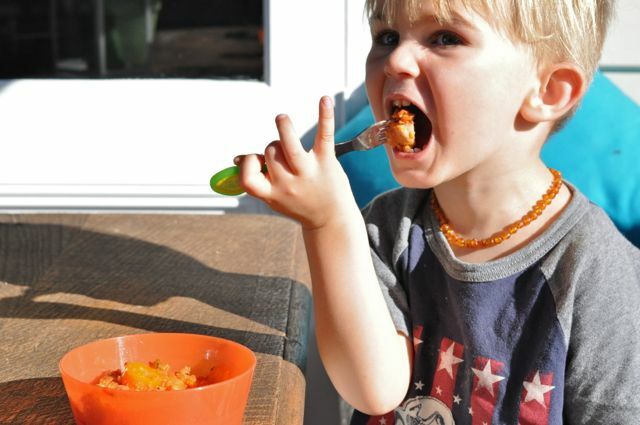 Toss in your carrots, and let them have a little sweat, before you add your tomatoes and beans. Stir in your herbs and bay leaves, add stock and wine and leave for a few minutes. Add your meat back in and let it all have a good bubble on the stove for about 20-25 minutes. Pop your oven on to to about 180C. In a bowl place your breadcrumbs, and season them well. Add your dried thyme and mix through. 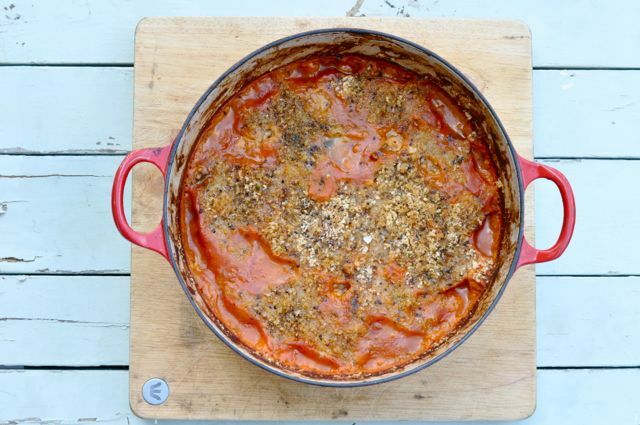 Pop it on the top of your cassoulet and then drizzle a slug of olive oil over the top before placing into the oven until they brown slightly, and everything thickens and goes delicious. It’ll probably take about an hour to an hour and 20 minutes. Keep a little eye on it. Serve it up with a lovely fresh salad – I love a baby spinach, apple and avocado salad with this as the crisp sweet apple and creamy ago really compliment the cassoulet. I still add Tabasco to mine as I discovered something great that fateful day. 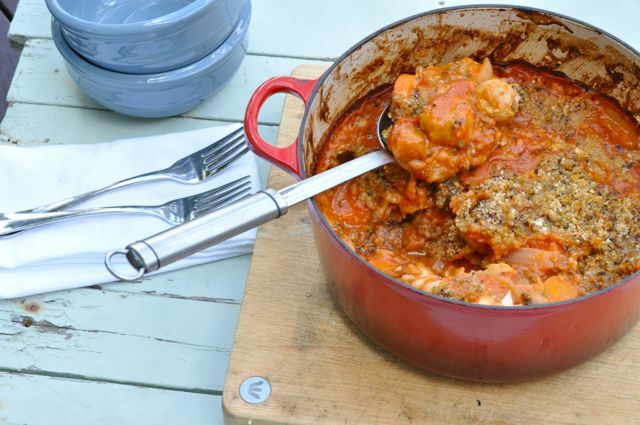 For heaps more family friendly recipe ideas why not check out my ebooks. I think I have that exact pot at home! How good are they? My La Crueset pot is one of my treasured possessions…. Can I come over and be part of Triple Date Night? That dish sounds amazing, and what an awesome tradition with so many memories. Maybe you guys can do them again, albeit less frequently, but with just the same enjoyment. 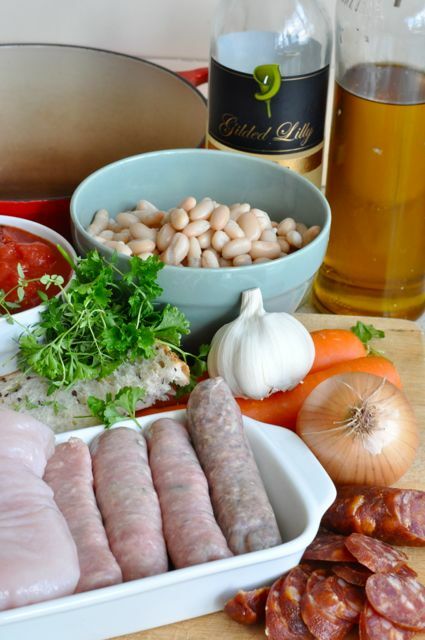 Triple date night sounds fun and your cassoulet looks delicious! It was fun….you should host a date night. You might bring it back to life!